We’re still working away on the house, trying to get moved in before the foul weather sets in and our bank account gets to zero from paying rent and mortgage at the same time. We’re getting close… there are three main tracks going on, so that when one gets hung up, I can work on the other: finishes, bathroom, and water supply. Water supply has taken much of my attention lately, as we’re waiting on a few things for the bathroom, and the finish work gets worked on in spare time. 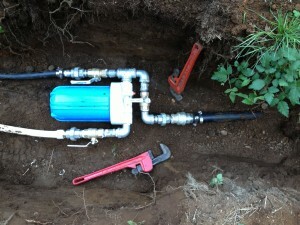 We had the well put in a few months ago, but we won’t have an operational water supply until I get the pump installed. That includes the water lines and electrical service out to it, which we’ve got in place, but we also need to build a little shelter to protect the electrical equipment and valves and so forth at the well head. It’s like building a house in miniature, but a little less complicated. Luckily, we have the skills! Here you see Emily smoothing the floor slab, as Josh and I bring the concrete in wheelbarrows from the truck (the ground is too soft around the pumphouse for a big truck like that). 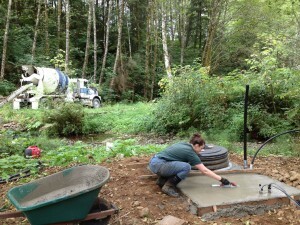 Once the slab was in place, the next job was to install the well pump. It’s a special low-head, high-volume submersible pump… normally, shallow wells like ours are run by a jet pump (which sits above the well) but they have higher power usage then a submersible pump. Those are usually for deep wells, and have a different performance curve that what we need, and are much more expensive that what we have- which uses less amps and throws water like a firehose. Here we see the pipe that go through the side of the well casing, where it then turns downward and toward the pump sitting in the bottom of the well. At the other end, it connects to the pressure tank manifold. Towards the top of the picture, you can see a few valves where the whole thing connects to the water lines (the smaller one is for a future veggie washing station). The pressure tank is partially filled with air. 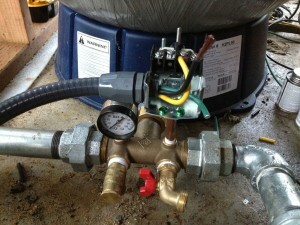 The idea is, the pump kicks on and pressurizes the system to a preset cutout pressure, in our case, 60 psi. When it gets that high, it turns off. When you open a faucet in the system, the pressurized air pushes the water out until the pressure drops to a cut-in pressure (40 psi) and then the pump kicks on until it gets back to 60psi. This keeps the pump from running all the time, saving electricity and wear on the machinery, while still delivering smooth water pressure. The 50-or-so psi of pressure is good for us, as it means we’ll have about 35-40psi at the house after losing some to the height difference and friction losses through the line. Incidentally, our line is really big to reduce those losses (1.5 inches!). Here you can see the pressure gauge showing “0”, right before I fired up the pump for the first time and water started squirting out of a half dozen joints I didn’t get tight enough. 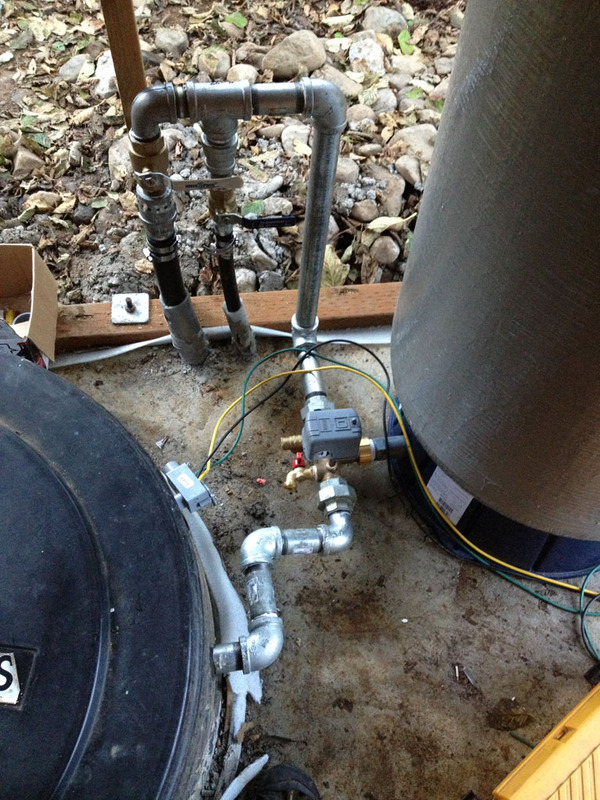 At the top of the hill, right below the house, we have a grade box with a whole-house water filter and some more valves. The big one is for the house, the smaller one will go to a yard hydrant for watering the little herb garden next to the house (and that water will be unfiltered). This is one of the places where I still have some work to do… when I pressurize the system, there is a tiny leak on one of the joints. Which is annoying, as taking all that plumbing knotwork apart is somewhat of a headache. But not as much as the one in the pumphouse, which I took apart eight times last week until I finally gave up and replaced the leaking valve entirely (which fixed the problem). 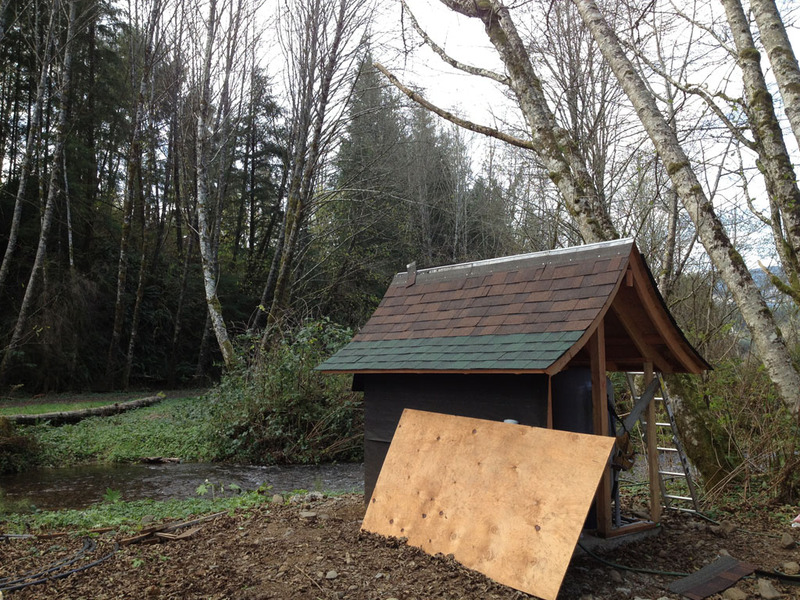 Now that the rains are back, the roof has to go onto the pumphouse. I’m still too distracted with higher priority items to get the walls/ siding on, so tar paper will have to do for now, but the roof is on. I was excited to do cedar shakes originally ($400), but figured I’d have to settle for buying asphalt shingles ($150) until Emily pointed out that I could get leftover ones at the re-store. She’s pretty good at stretching the money. That brought the roof down to $50, and only required a little creativity to accommodate the fact that they were from different color lots. I think it looks awfully good for $50. All this, and not a moment too soon. We got some freezing weather this week, and when I went to use the water from the rainbarrels, I found that the whole mess was frozen. So I turned the hose bibb on the side of the house, and Ta-Daah! Water. What a nice feeling. Now that winter is settling in, it’s time to go around and check on my hives. By now the bees have snuggled in for the winter dormancy, and ideally they’ve stocked up on honey to get themselves through the winter (assuming, of course, the beekeeper didn’t take too much, which he didn’t in this case). The best check is pretty simple: you grab the back of the hive, and try to lift it. If you can’t, there’s enough honey in it. 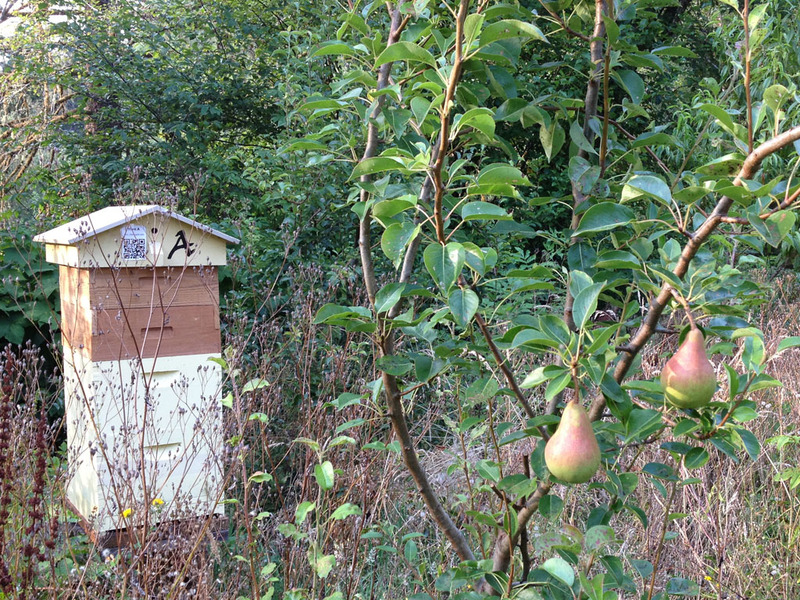 My first stop was at the Foss Road apiary. Our friends who run a beef business let me keep bees on their farm, and those hives are doing OK. 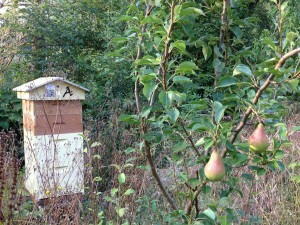 This was their first year, so they are still “new-bees” and aren’t yet at full honey production. Though heavy, I was able to lift each of them, so I fed them some sugar to help the bees bulk up for the holidays. Merry Christmas, ladies. Disaster! Within the last few days, a stump I was using as a hive stand had disintegrated, dumping the hive on its back Luckily it didn’t go onto its side; when that happens, the combs collapse, flattening everyone between them. Luckily, it fell in the “right” direction, parallel to the comb. Unless the queen was unfortunate enough to get pinched, it will probably be fine after I right it. Which gets to the bad part, the part I like least in all of beekeeping. This is the third time I’ve had to pick up a tumbled hive (the other times were after a storm, and when I bumped one with the tractor) and I know from experience: the bees are not very amused about the situation. They are scared, defensive, and want to lash out and lay a heap of stinging on anyone dumb enough to be within reach. Despite the protective gear, I get stung several times whenever I do this. But it’s part of the deal. So I sigh and shrug, and take my medicine. I only got three stings this time, but not for lack of trying on their part. I walked 200 yards from the site and still had a beard of really mad bees hanging on my veil, trying valiantly to put my face to the sword. 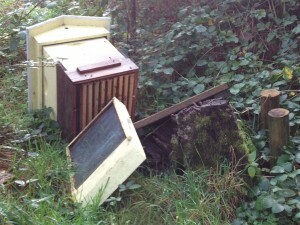 But the hive is now upright, ready for winter, and I’ll be moving it to a new stand come springtime. So… you may have noticed I didn’t mention the third apiary at Gravel Creek. 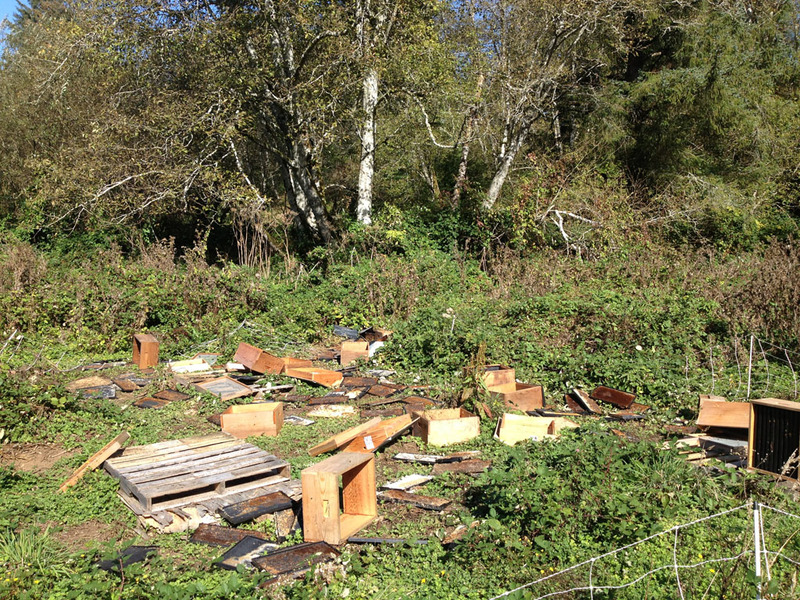 It’s taken me a while to make peace with what happened, but basically, a bear destroyed all 8 hives last month. In terms of life, it was a total loss: about a quarter of a million bees dead. I was able to clean up the mess and most of the woodenware is not broken (but has cool bear claw marks on it! ), but it’s going to be about a thousand bucks to replace the bees… not to mention the entire year lost, as the bear ate all the brood, comb, honey, everything. I’ll be starting over next spring from scratch. It’s kindof my fault, as I didn’t keep up with the weeding, and aggressive plants choked out the electric fence and discharged it- allowing the bear to waltz right in do his thing. 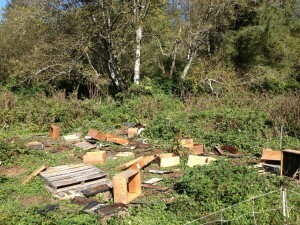 This image of my ruined apiary will be etched in my mind for some time to come. I’ve posted about this topic in general before, explaining what a GMO (Genetically Modified Organism) is and why it might be a bad idea to set it free in the environment, let along eat one. Click here to catch up. For years, the “Right to Know” movement has been gaining force, with people demanding that there be a requirement that foods containing GMOs be labeled as such, much like foods containing allergens (peanuts, etc.) or dairy products produced with bovine growth hormone. The general thinking here is that if we can’t legislate against the use of GMOs in our food, at least we can force manufacturers to admit when they are using them and vote with our wallets. Right now, GMOs are sneaking onto our food supplies in a lot of hidden, insidious ways. This voting season, ballots measures in Oregon and Colorado (two of the craziest liberal states?) are up that, if passed, will require food manufacturers to admit when they are using GMOs in their products so consumers can decide for themselves if they want to eat them. The Cornucopia Institute, a nonprofit watchdog agency, just released a good infographic showing which companies are donating big sums of money to either side of the political campaign. Some big spenders on the Pro-GMO side are no surprise: agorchemical giant Monsanto donated millions against our right to know, for example, but who would have expected Santa Cruz Organics, Lara Bar, Kashi, and Annie’s mac-and-cheese? 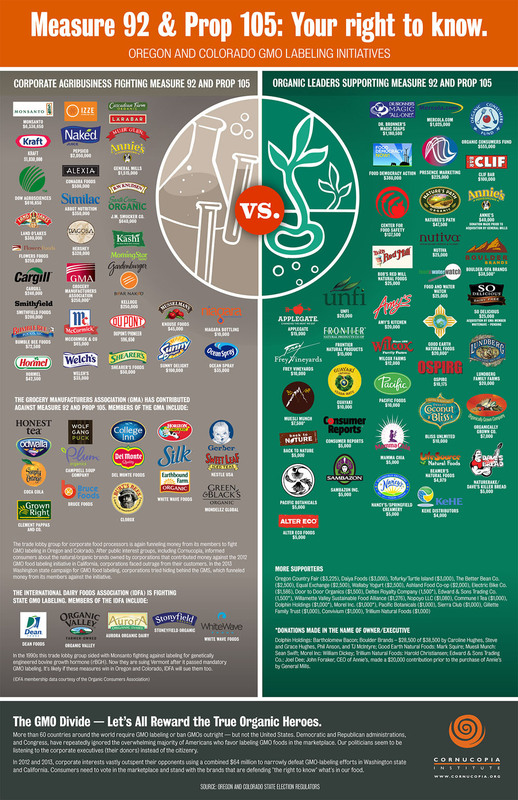 Turns out, those companies are owned by food giants General Mills and Kellogg, who have a vested interest in us not knowing exactly what goes into their products. 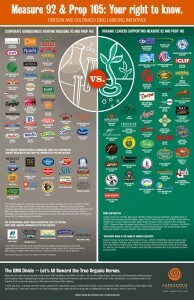 Currently, Maine and Connecticut are the only states where consumers can tell if GMOs are in their food. Hopefully, Oregon (and others?) will soon follow suit. This is another sad instance where we’re lagging behind 65 other countries in protecting the health of our population in favor of making it easier on big corporations. We had an interesting diversion last weekend. Some local friends of ours who’ve been making their own wine for decades invited to join them for their annual fall trip to pick grapes. We waffled on going; we’re buried with the Dreaded House Remodel, and it would kill an entire day. But in the end, we figured that it would be a GOOD thing to take a little time to do something new, interesting, and couple-oriented. Boy, did we guess right. It was fantastic! 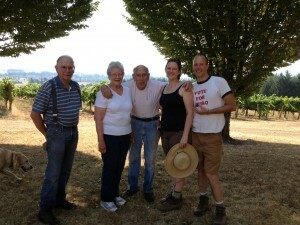 We joined Burt and Patty, our octogenarian winemaker friends, at the Courting Hill Vineyard about 90 minutes east of our house. 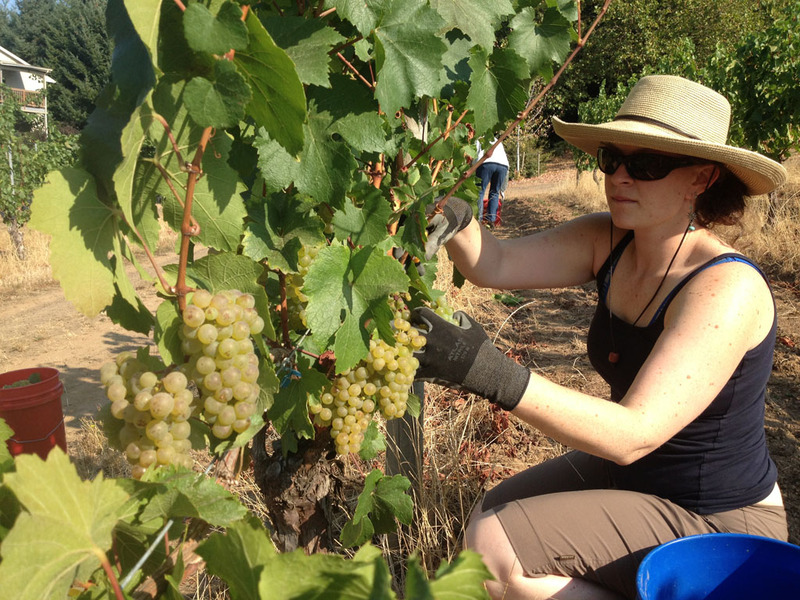 I bet you didn’t know that Oregon has a respected wine region with prefect climate for certain kinds of wine grapes, including Pinot and Chardonnay. Courting Hill is a small 80-acre specialty vineyard, that’s been run by a pleasant old fellow named Jimmy for over 30 years. 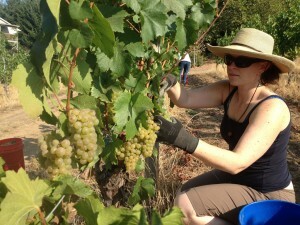 Here’s Emily picking the grapes. Apparently, there is a pretty narrow window for this, when the grapes are at maximum sugar but not yet getting moldy. Burt gave us the quick lesson on how to do it, and we got to work. It only took half an hour or so to pick the 200 pounds of grapes we needed for the wine. 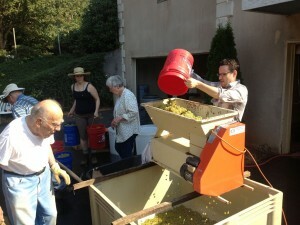 Then, we made our way back up to the house to de-stem the grapes with a motorized machine. Jimmy’s grandson Adam ran that process, with us passing buckets and so forth, and Adam’s wife Jenna moving equipment, spraying things down, and the all-important Setting Out of Snacks. 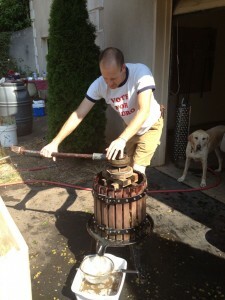 Once the grapes were de-stemmed, they went into the antique wine press. This thing was awesome… cast iron base, giant screw, big ratchety arm. Adam and I ended up doing most of the pressing, because I was 40 years younger than most of the folks there except Emily and Jenna, who were spending a lot of time talking about farm stuff. We’ve had this great fortune to meet many couples our age who are getting into farming, and we took an immediate liking Adam and Jenna- I feel we have a lot in common. Enthusiastic, part-time farmers with an appreciation of rural living, they moved out here a few years ago from the east coast to look after Jimmy (who is now 91) and help out with the vineyard. They soon figured out that Courting Hill wasn’t big enough to support them all, so they also have jobs in graphic design and photography. Interesting people. At one point during the pressing, Jenna mentioned that Jimmy used to fly airplanes for the military. I’m all about airplanes, so I asked him which kind. He flew this one… one of the most powerful, awe-inspiring fighters in the closing days of the propeller age. I said as much, and he shrugged his hunched shoulders a little and replied, “it was a fierce airplane.” There aren’t a lot of WW2 vets left any more, so I’m glad I got a chance to meet this guy. That, and he was funny, pleasant, and knowledgeable. Once the grapes were fully squashed, we transferred the juice to carboys in Burt’s truck for transport back to the Coast where he’ll be adding yeast, fermenting, and siphoning. 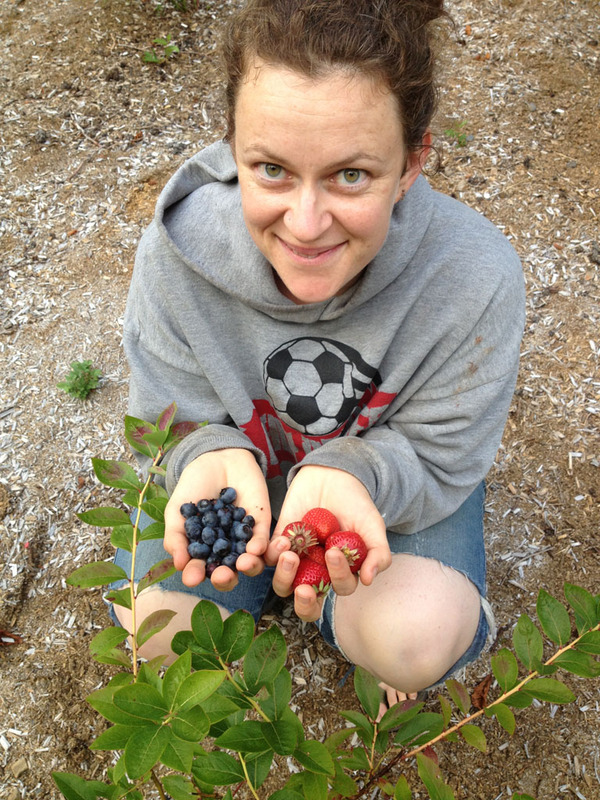 Emily and I spent some extra time with Jenna, who showed us a lot of other behind-the-scenes things they have going on at their farm- and she offered to give us a bunch of grape cuttings in the spring to plant on our farm! Apparently, there are a few varities that would probably do OK on the coast, including Glenora, Venus, and Himrod. Table grapes all, but super yummy nonetheless. 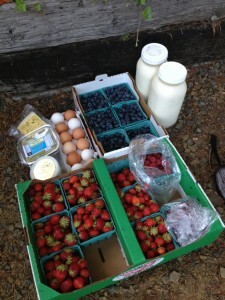 We gave Jenna and Adam some honey, and hope they will stop by our farm next time they are out at the coast. 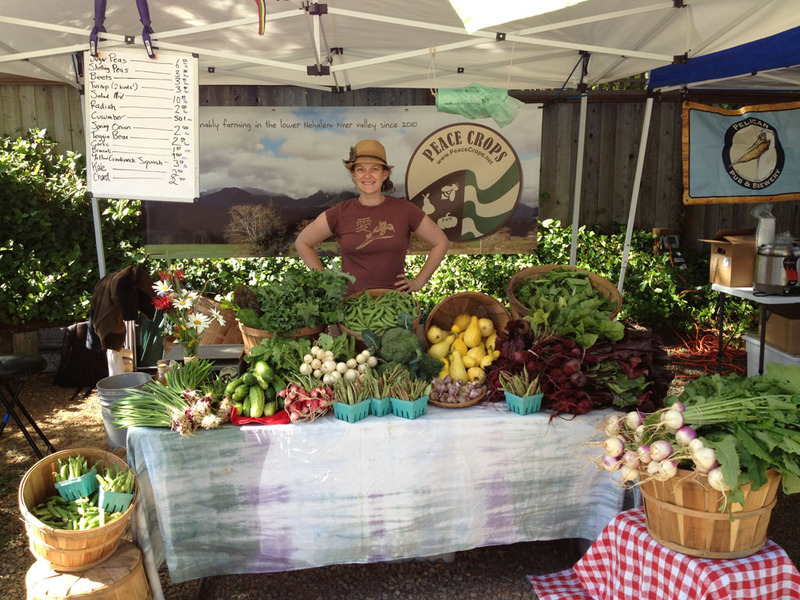 Farm exchange! In all, a perfectly splendid outing. We met some really nice people, saw pretty countryside, and even came back with six bottles of wine to help us through the coming wintery months. The final honey harvest is in. 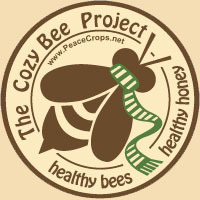 We had a particularly good year for bees; long warm summer with little rain to get in their way. As a result, many of my hives performed way above expectations and they look very healthy as we get ready for the winter dormant period. We also harvested the full gamut of varieties, varying from straight knotweed honey (the darkest one) to a very light multifloral that is mostly blackberry. Some of that is due to adding the extra hives, but not much- most of it came from the existing apiary at Miami Foley. Those colonies are mature, whereas the others are getting started so aren’t producing much yet. Next year will be a different story, and I fully expect to be buried in honey! I’ll need to prepare; extracting and bottling all that honey is a bit of work, and you have to buy a lot of glass to hold it all. 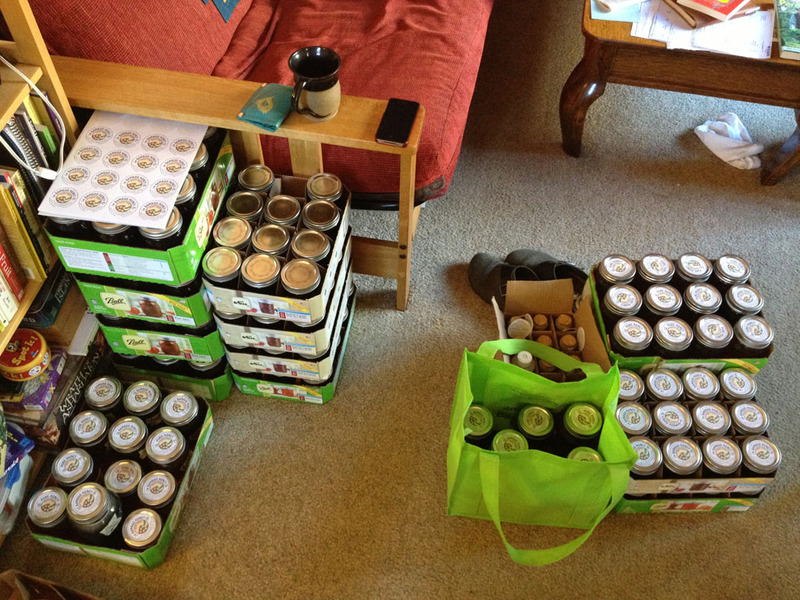 Here’s some of the harvest, ready for market, waiting on our living room floor. That’s less than half of it. Last night was the end of the market season for 2014. Wow, this year has gone by quickly. Here we are presiding over the stand, waiting for the starting drum and first rush of customers. It’s nice that we were able to still have a pretty good showing, despite paying a lot less attention to the garden this year while distracted with all the housebuilding. Even with the lower attention to gardening this year, we still managed to increase sales over previous years. This is encouraging! We feel confident we’ll do even better next year. Oh, and notice that spike in the graph the last few weeks? That’s when the honey comes on (more about that in a future post). We officially started the “decommissioning” process of the garden today, and have stopped watering and tending. What remains- mostly pumpkins and winter squash- will do fine without water, as it dries out and cures for its final stage. The focus, for now, is to get moved into the new house. Immediately thereafter, we’re going to start moving the garden from the old property to the new. We’re extremely grateful to Ryan, Julie, Betty, and Farmer Ned for all their suport while hosting us these last three years and we look forward to now living on the same property we are farming in the years to come. There haven’t been a lot of posts lately, because we’ve been pretty busy with trying to finish the house, and my architecture business has also been quite brisk this summer- you know the saying, “make hay while the sun shines.” This has left less time to pay attention to the farm tasks the way we’d like. 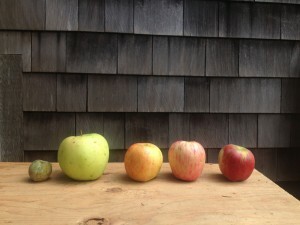 This week, however, we were able to sample the fruits of our labor (literally) and have a private Apple Tasting. Here we see several of the varieties that came out of our orchard, from left to right: green gage plum (OK, not an apple, but really tasty nonetheless), Chehalis, Gravenstein, Honeycrisp, and Spitzenburg. 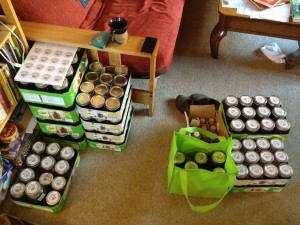 Not pictured, we also had Cox’s Orange Pippin and Bramley Seedling. The results of the taste test were interesting, enjoyable, but inconclusive. Chehalis: Green, firm texture, slightly tough skin. Emily: “Like a granny smith!” My favorite of the trial, I found it fulfilling and satisfying, a nice blend of tart and sweet. Also the largest of the bunch. Gravenstein: Reg & green w/ orangeish tint- firm texture, moderately tough skin. Sweet, candylike flavor. Emily liked the flavor the best, and I agree, it had a lot of personality. Honeycrisp: Red & green, firm texture, medium skin. Crisp and sweet, it totally lives up to its name. It’s our friend Adam’s favorite, and he donated the Honeycrisp trees several years ago. It will be nice next year when we have more than two of them, so we can send him some. Spitzenburg: Red & green, firm, w/ tough skin. Very “bright” taste that is tart and sweet. We think this one might not have been quite ripe. It has a cute pink blush on the flesh inside. Supposedly susceptible to lots of apple diseases, it’s an old variety that Thomas Jefferson liked. And we also had a really pleasant surprise to go with all of that. 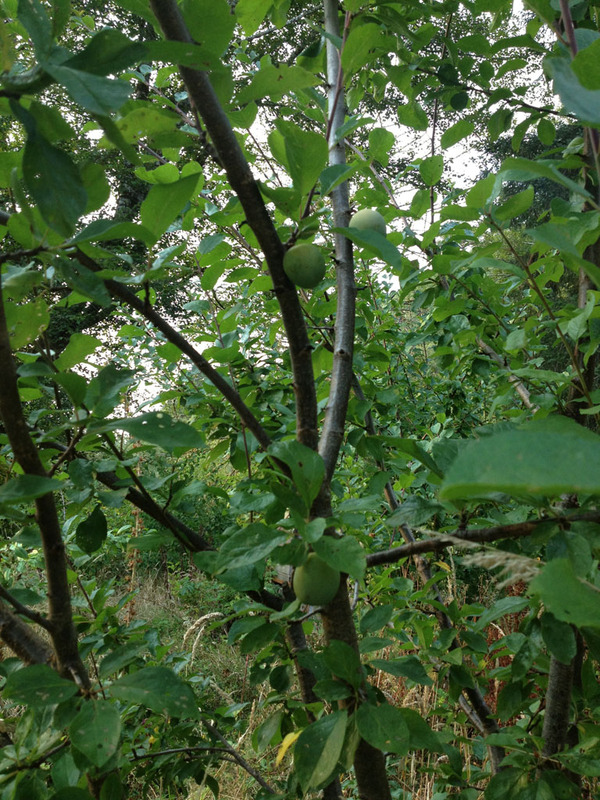 Years ago when we first planted the orchard, I installed three peach trees the would supposedly survive this climate. I didn’t really tell anyone, because I figured they’d laugh at me… but I knew that I’d get the last laugh if we ever had a really long summer. And this summer was just that. On the way out of the orchard, I happend to see a flash of peachy color out of the corner of my eye, very high in one of the Charlotte peach trees. This was the single end result, and it was glorious. 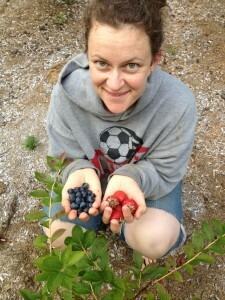 In the mayhem and distraction surrounding the house remodel, we’ve been lax on some of our farming endeavors. Our blueberries and strawberries, for example, have only received the most superficial care- a few weedings and that’s about it. Despite that, they have still yielded some tasty snacks for us, as you can see in this picture. In this case, the timing was perfect: an evening where we were gardening late, forgot to bring food, and were really needing a snack. The orchard, however, is in a truly sad state. It hasn’t been mowed or tended AT ALL this year, and looks completely derelict. It’s shameful. Earlier this week, Farmer Ned was over by our fields hauling firewood, and he stopped by to have a chat. “Got any apples on yer trees?” he asked. This made me feel quite silly, as I really had no idea. I’ve been so busy I haven’t even checked. To avoid looking like the worst farmer in the world, I said something weasly like “They’re not doing much this year” then started talking about Ryan’s apples up the road, which are doing quite well. A few days later, though, Emily and I were fiddling with the irrigation system and had a few quiet twilight minutes to enjoy a little break, so we toured the orchard. What a surprise! 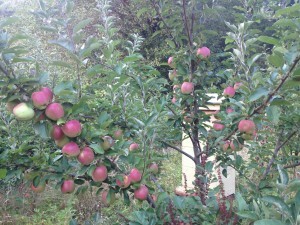 The Spitzenburg apples were loaded on the tree, and there were some Gravensteins as well. Further investigation found a mountain of crabapples on the Whitney (it did that last year too). But then Emily cried with glee at seeing a pair of pears! What fun. They look so happy on the tree. 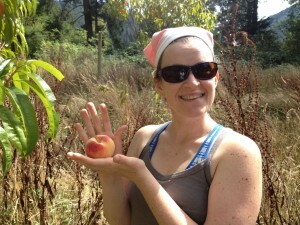 I took one to try, and it was well shy of ripe. I kindof suspected that would happen, but I couldn’t help myself. 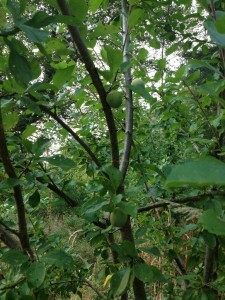 The best news of all, though, was on the way out when I noticed there are plums on one of the Green Gage trees. I have only recently learned to appreciate plums, probably because grocery store plums are not too inspiring. A very fresh plum, however, is an incomparable treat. I gently squeezed a few of the plums, and they were pretty hard, but I found one that was soft so I picked it and we tried it. WOW! THAT WAS AMAZING AND I MUST HAVE MORE! We will be planting a few dozen of these trees at Gravel Creek, for sure. 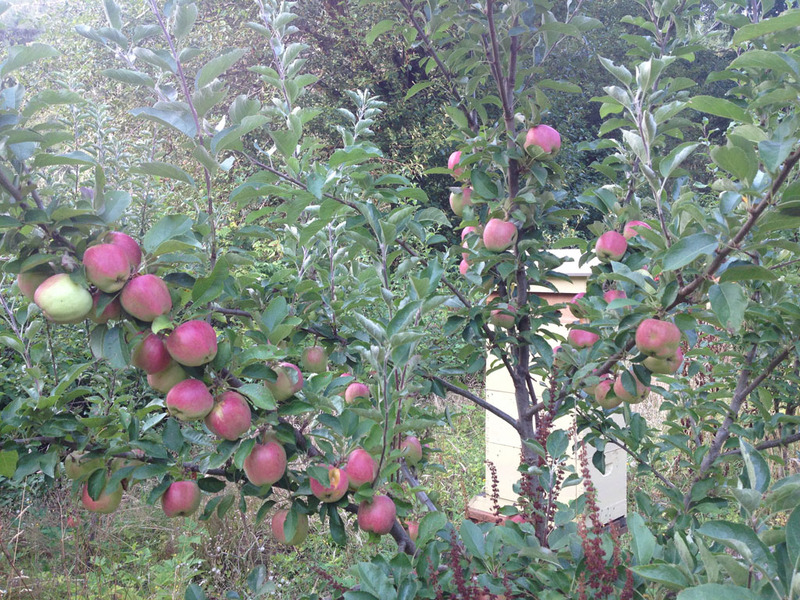 In addition to growing well and looking great, these trees make a delicious treat indeed. The best part of the farmers’ market (besides seeing our friends) is the last 10 minutes. That’s when the crowds have mostly gone, vendors are chatty, and with only a few minutes left, everyone starts drifting around to their neighbors’ booths with armloads of produce to trade. It’s like a food swapmeet. 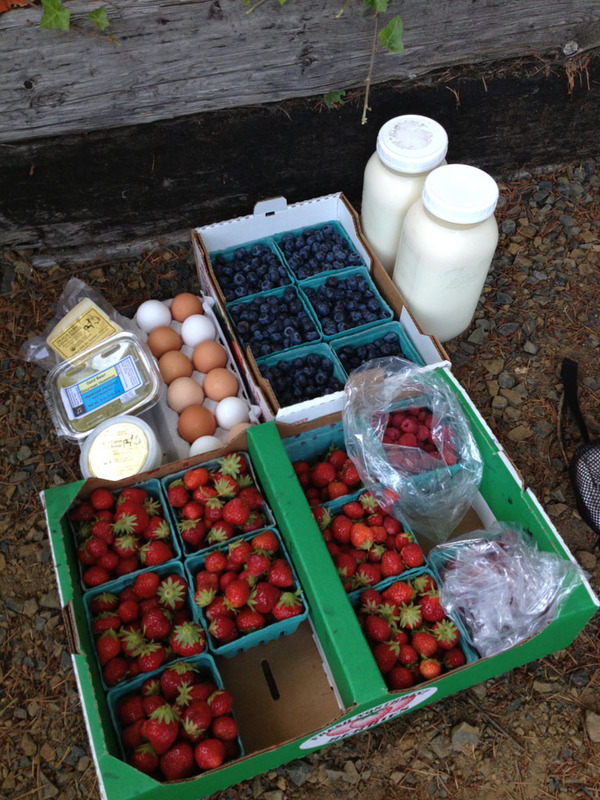 Here we see last night’s haul of groceries acquired by barter: hard goat cheese, hummus, feta, eggs, blueberries, fresh milk, strawberries, and raspberries. I might add that the hot food vendors participate, as well. Not shown is the tasty bowl of chili that I ate, and the hot panini that made Emily’s dinner earlier in the evening. Those vendors have shut down their grills by end of market, but dutifully drop by our stand to select some tasty veggies to take home with them. Some nights, we even trade for things like wine. This all got me thinking… though we clearly don’t (yet) produce all the groceries we eat, how does our annual grocery bill compare with our overall produce sales? A little time with the accounting software came up with the answer: gross farm sales for the last 12 months is about $500 less than our entire grocery expenditure for the same time period. Wow! Who knew? And I expect that our overall revenue this year will increase enough that we will likely produce more than we eat. So, effectively, we can say that our garden feeds us… just that for now, we still have to use some green paper as a trade intermediary. And a little update on the farm, while I’m at it. This picture makes me extremely happy, mostly because of how much of a good time my Dad is having in the background (click to enlarge). 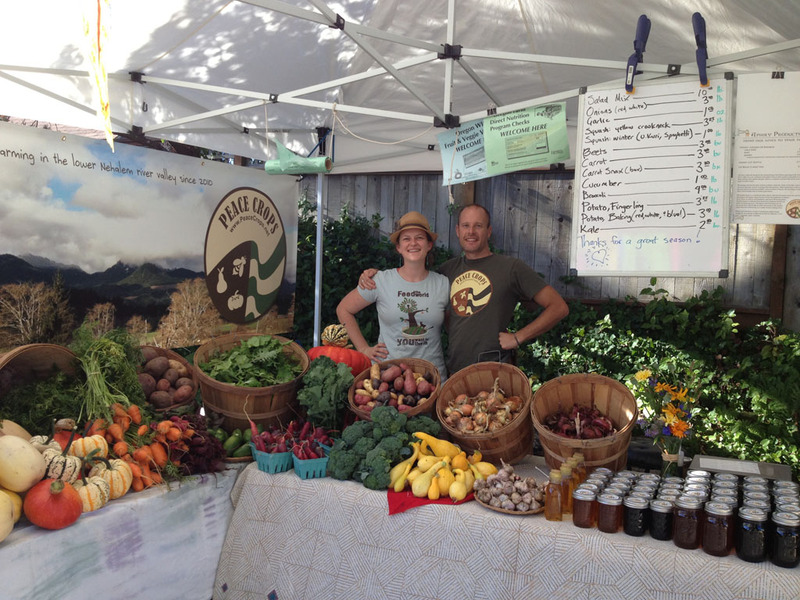 He and mom helped us harvest for the market twice during this visit, and it was a hoot. Good going taking a 10-day vacation, Mom! 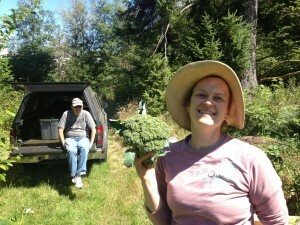 Emily is showing off this broccoli becuase it’s the beggest she’s ever grown. That is, until the following week, when she found one almost twice that size. It weighed in at 2.5 pounds, and a very heppy person bought it for $10 at the famers’ market. And, I assume, fed his entire family. If you want to see it, though, you will have to go check out Emily’s facebook page. Our farm is doing pretty well, despite the extreme lack of attention we’ve been giving it. 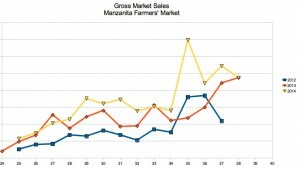 So far at each market, we’ve grossed more than all previous seasons. This bodes well for the day when we can actually focus on making the garden great. Here’s a picture of the stand two weeks ago. 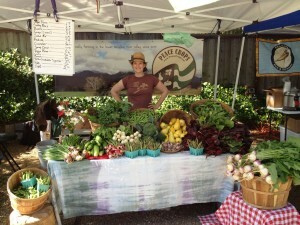 I didn’t take one this week, as I got there late, but we actually had TWO full tables of produce. Yay!